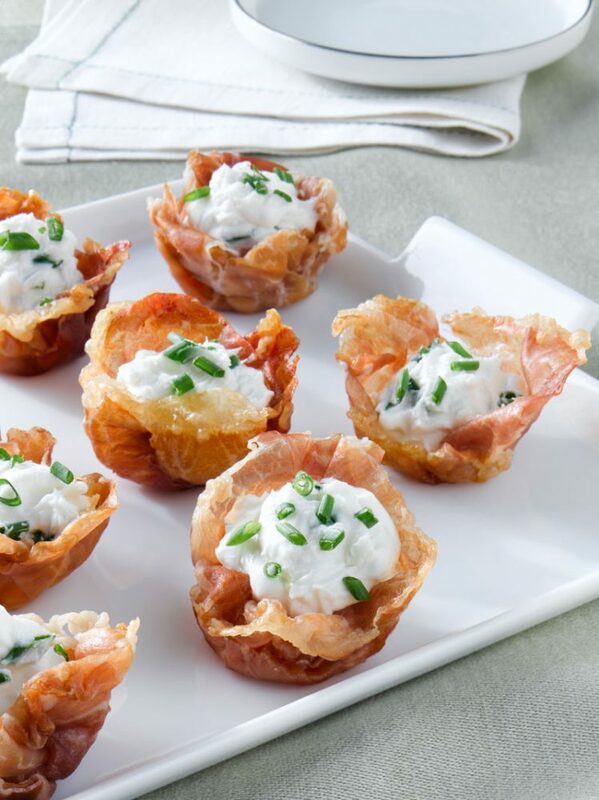 Looking for a fun and eye-popping pre-gaming appetizer? Well, it doesn’t get more impressive than this prosciutto and cheese beauty, with cups made from the one and only Prosciutto di Parma and filled with goat cheese. Just shape, bake and fill. This recipe provides an easy and convenient way to create perfectly-sized Prosciutto and cheese appetizers that hold a winning combination of flavor and elegance. So appropriate for entertaining! Cut Prosciutto di Parma slices in half crosswise. Press each half slice of prosciutto into each cup of a mini-muffin pan. Bake for 8-10 minutes. In the meantime, in a small bowl combine goat cheese with milk and chopped chives until creamy. Remove Prosciutto di Parma cups from the oven and let cool. Pipe or spoon about a tablespoon of the goat cheese mousse into cooled Parma cups.